The Madan Mohan soundtracks I've featured so far have all been from the 1970s, yet his career did in fact extend back several decades. 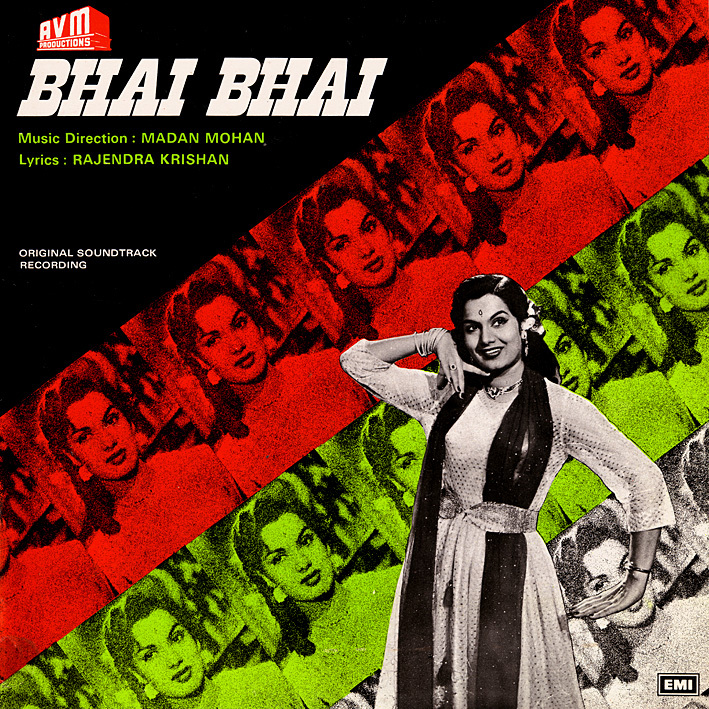 'Bhai Bhai' is from 1956 and I was primarily attracted to it because of the lovely, lively 'Ye Dil Muje' which appeared (in shortened form) as 'Ae Dil Mujhe Bata De' on the Geeta Dutt compilation posted a few months back. She's credited under her maiden name on this issue of the soundtrack (one with a different cover had been released earlier); incorrectly I believe, as she had already been married to Guru Dutt a few years when it was recorded. All the other songs on the album feature Lata Mangeshkar, Mohan's female singer of choice. It's a very lively score for the most part. 'Mera Nam Abdulrehman', 'Duniya Mein' and 'Sharabi Ja' are infectious and danceable and tear along at nearly frenzied tempos; as such the slower paced 'Ghar Mera' is an almost welcome respite. But as with many Bollywood soundtracks of the era, everything has that compelling, almost mysterious, old-wordly aura about it I find really appealing. Incidentally, there's also an Ollywood film with the same title and from the same year as this one. I have to admit that led to some confusion while I was researching this post. That little gem, "Dil Teri," features Lata at her very best. Masterful, beautiful, and I must say, perfectly perfect. This album is really something. Thank you. @Aditya Pant: Are you sure? And if so how do you know, as she's not credited anywhere, while Lata is. I am totally sure. There is no mistaking Asha Bhosle's voice in this. If the record has Lata's name on it, it is an error that the record companies make often. There have been several instances of wrong credits in the past. Fair point. Not only record companies though, as she doesn't seem to be credited in the movie either.